Please note that you have only three days left if you want to get your physical shares dematerialised as thereafter it can be only be transferred under transmission and transposition policy. According to Sebi, no transaction for transfer of securities of a listed company, at a stock exchange or an off-market transactions between buyers and sellers, can happen in physical certificate form. 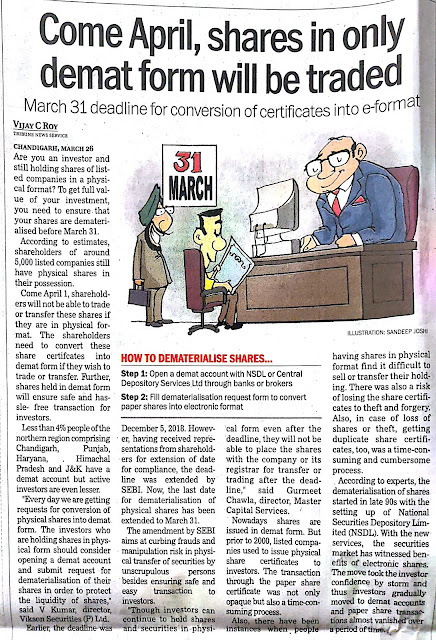 So, all shares held in physical after March 31 will become illiquid except for transmission and transposition. Transmission (transfer to heirs in case of death of owner) would be possible in case of inheritance but the new owners will have to dematerialise the shares if they wish to sell or further. On the other hand, transposition means change in ownership pattern. For example, change in combination from A & B (in this order) to B & A or from A & B & C to B & A & C will still be possible in paper form even after March 31, 2019. Do remember to check the Intraday Tips for Today NSE and start taking a pie of your profit which you deserve with quality support.